This is really just another take on the Eggs Benedict theme….poached eggs with hollandaise sauce, sitting on, this time, spinach. 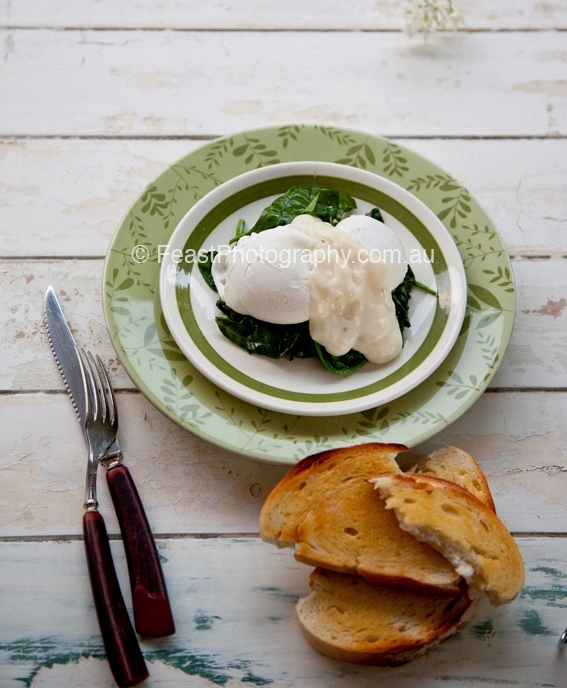 True ‘Eggs Florentine’, it is not, despite the fact that many breakfast-serving Brisbane restaurants are calling it that. I guess you can call anything sitting on spinach ‘florentine’! Nevertheless, the egg, spinach and hollandaise combination is quite delicious! Brush both sides of the sourdough slices with a little olive oil and place under a hot grill for 1 – 2 minutes each side, until crisp and golden. Rub one side of each slice with the garlic clove. Top each slice of sourdough with a generous quantity of baby spinach, top the spinach with 2 reheated and well-drained poached eggs. Spoon hollandaise sauce over the eggs. Sprinkle with a little cayenne pepper, then season with sea salt and freshly ground black pepper. Garnish with the chives and serve immediately.